The Faculty of Science is excited to present the inaugural Distinguished Scientist Lectureship Seminar series. On Wednesday, November 8, 2017, we will host the highly distinguished and decorated Canadian physician, Dr. Lorne Tyrrell. All are welcome to his presentation on Transforming Viral Hepatitis. Dr. Tyrrell, who was inducted into the Canadian Medical Hall of Fame in 2011, is credited with the development of the oral antiviral drug, lamivudine, as a result of his research into viral hepatitis, saving the lives of thousands of people infected with hepatitis B. The drug allows liver transplants for persons infected with the disease. Born and raised in Alberta, Dr. Tyrrell is currently Professor in the Department of Medical Microbiology & Immunology at the University of Alberta. 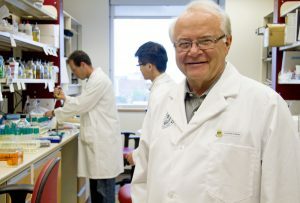 His research continues to focus on the study of the hepatitis B and C viruses, from his lab in the Li Ka Shing Institute of Virology at the UofA. Recognized worldwide for his dedication and revolutionary work, Dr. Tyrrell is an officer of the Order of Canada, a member of the Alberta Order of Excellence and a fellow of the Royal Society of Canada, and has received many more awards and honours. The former Lieutenant Governor of Alberta, Lois E. Hole, once said that Dr. Lorne Tyrrell was a true representative of what it means to be a great Canadian, a modest and unassuming individual who has accomplished so much. Concordia University of Edmonton is proud to host such a distinguished guest and welcome all to join us and be inspired.